St. Patrick’s Day evokes a certain set of images that we all associate with the fun-filled holiday: green clothing to ward off pinches, mischievous pranks, four-leaf clovers, and celebrations. Here at our Extra Attic locations, we even think of springtime at the same time as winter items start filling up our storage spaces. But this year, before anyone brought out the chocolate coins or green ties, one of our own staff members, Hank Baxter, observed an annual tradition that had nothing to do with the color of his shirt. 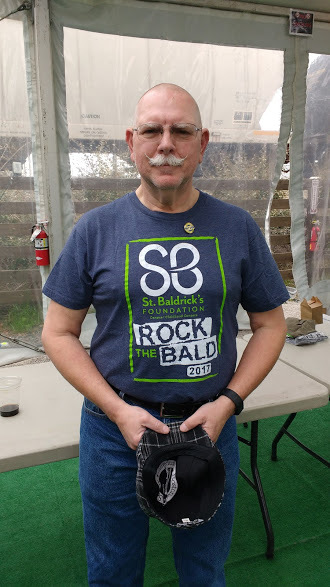 On March 10, Hank – who is the property manager on staff at the North Raleigh location on Durant Road – participated in his second St. Baldrick’s event and shaved his head to help raise money for cancer research. St. Baldrick’s was founded with the purpose of working with pediatric oncologists across the board and creating funding opportunities for research efforts that seemed to be the most promising in assisting children diagnosed with cancer. In the U.S. alone, more children succumb to cancer than any other disease. But with events like the one Hank participated in, the foundation helps healthcare professionals work toward a future with healthier kids and brighter futures. Anyone can sign up, and since 2000, the head-shaving events have gained a lot of traction with the larger community. At last check, St. Baldrick’s reports that more than 1,000 fundraising shaves occur around the world to encourage awareness and raise funds for childhood cancer research. As a company, Extra Attic takes time and space (literally!) to assist and show support for local, regional and national organizations. Whether it be through reserving some storage space for the group to use on a regular basis or actively participating in an event, the company carries on a tradition of mindfulness within each community it serves. Its employees, like Hank, then take the time to go above and beyond in their own ways through causes that hold personal significance. To learn more about Extra Attic and the opportunities we present to charity organizations, contact us today!